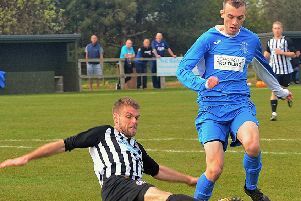 Alnwick Town have been drawn against Billingham Synthonia in the FA Vase First Qualifying Round – and could face rivals Morpeth Town in the next stage. The St James Park side will travel to fellow Northern League division two outfit Synthonia on Saturday, September 5, for the cup clash. The winners are scheduled to face either Morpeth or Padiham in the Second Qualifying Round on Saturday, October 3. Egen, who became manager in May, is already putting his mark on the team. He said: “I have brought up to Alnwick, assistant Chris Hay and coach Adam Laidlaw to help me begin the process of bringing stability and success. “Our first few pre-season games have shown that we are moving in the right direction. “This is mainly down to 22 men being willing to listen, learn and work hard to put my team’s ideas into practice. “Our main objectives are good organisation all over the pitch, compact defending which is hard to breakdown and quick counter-attacking. These are hard work and take time. “We are doing this though with a football and not slogging the feet off the lads in pure fitness sessions. “We brought in no fewer than 14 players who weren’t playing for the team in April, who range from Alnwick lads down only as far as Blyth, so all Northumbrian. “The fans are key this season as we are learning new strategies, so won’t be on song every game, but we will show improvement every month.